K-Lite Codec Pack is my bundle of choice and most common answer to media playback issues. However at times simple (re)install of this one is not enough. Aside from codecs it also includes number of relevant tools. 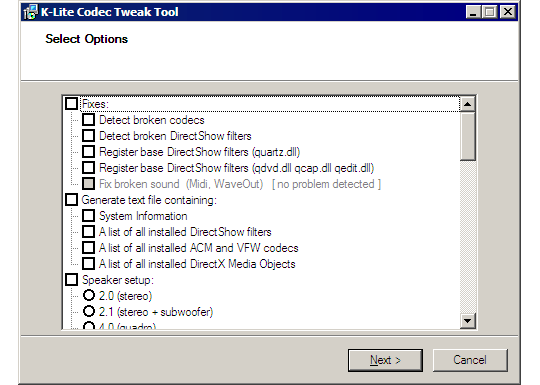 One of those is Codec Tweak Tool – utility to diagnose, tweak and resolve media issues. App works like install dialog, uncommon approach but surprisingly fitting. Depending on task chosen there may be only one or up to several dialogs to go through. There is no clear core function – only set of various tasks, joined by being relevant to codecs. selectively enable and disable specific codecs. It is hardly single click solution, but it is great tool to start with in case of complex issues. Comes with K-Lite (in Tools subdirectory if installed) or as stand-alone. Numerous functions and especially good log creation (logs are always good to troubleshoot). One of those apps that are rarely needed, but total life-savers when they are.